The Skinny distributes 27,332 copies accross Scotland every month to an average 581 distribution points. This figure is verified by the Audit Bureau of Circulation (ABC) and our circulation certificates can be viewed freely on the ABC’s public-facing website – click here. Distributing this many magazines is no easy task, and requires constant attention to our distribution network. This is the cumulative effort of a hard-working distribution team and the cooperation of each and every one of our 500+ distribution points across the major Scottish cultural centres. And to have an external body – the ABC – verify our numbers ensures we’re a cut above the rest, with legitimate cause to shout about it. We wouldn’t be where we are without our distribution venues, many of whom are long-term supporters (and friends!) of The Skinny. 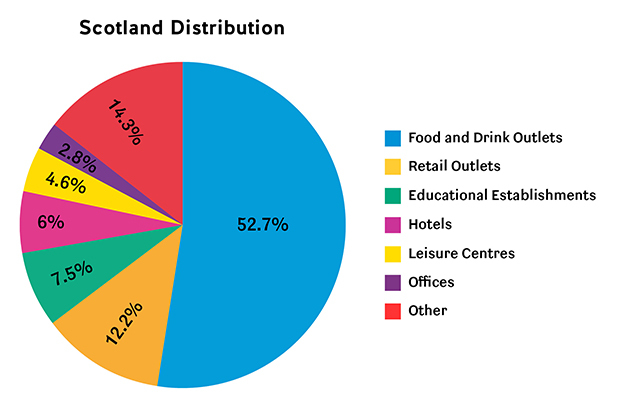 The pie charts below offer a breakdown of where we distribute within our catchment. (If you would like to know more about where we distribute, or would like your venue/shop/dungeon/festival/front room to stock the magazine, please contact your local sales teams on 0131 467 4630. You can also email sales@theskinny.co.uk with your query. Any venue that stocks the magazine should have a venue profile on theskinny.co.uk. If you spot a venue that you think should have The Skinny, but doesn't already, please drop us a line at distribution@theskinny.co.uk. We also stock the magazine as a one-off at partnered events, which are myriad and take place year-round. To read about opportunities and partnerships with The Skinny click here. Many retail outlets have taken up distribution agreements with us beyond simply having the magazine visible in-store: some include the issue in the customer’s bag of purchases showing a clear connection between our audiences. The Skinny knows its readers are discerning, culturally-savvy trend-setters – that’s why we’ve conducted research into other publications of our type around the UK. While they all have different characteristics and personalities, The Skinny consistently comes out top when it comes to our distribution. This PDF compares our music coverage (a key component of any cultural magazine) with other major music magazines in the UK, such as Q, Kerrang, The Fly (RIP), and the NME. Our latest audits have shown we’re number one across the whole of the country.